What?!?! 只要$10 的Stila 夏季新品 Charmed 眼影盘?! 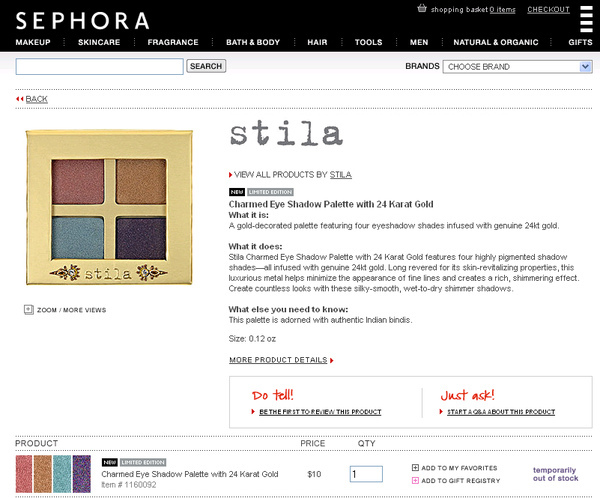 A gold-decorated palette featuring four eyeshadow shades infused with genuine 24kt gold. Stila Charmed Eye Shadow Palette with 24 Karat Gold features four highly pigmented shadow shades—all infused with genuine 24kt gold. Long revered for its skin-revitalizing properties, this luxurious metal helps minimize the appearance of fine lines and creates a rich, shimmering effect. Create countless looks with these silky-smooth, wet-to-dry shimmer shadows. This palette is adorned with authentic Indian bindis.